Originally published on Ann Voskamp’s blog, A Holy Experience, “One Key to Walking Through Suffering” was written by Bethany Hoang. 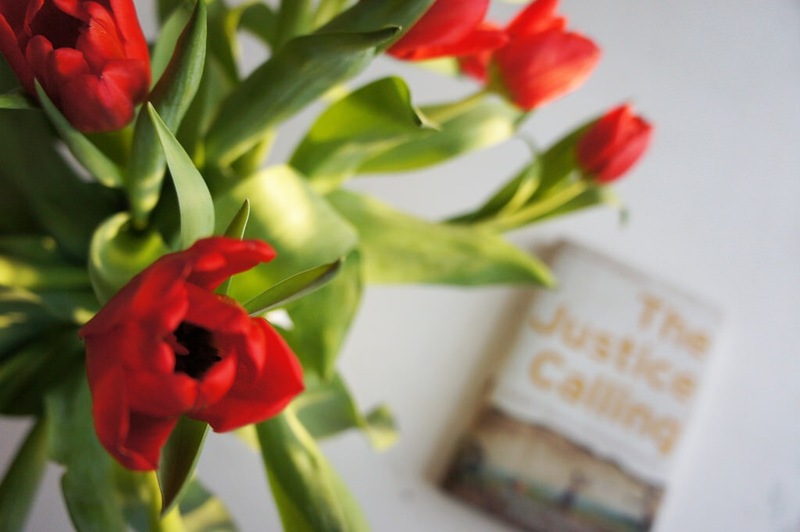 Bethany co-authored The Justice Calling: Where Passion Meets Perseverance with Kristen Deede Johnson. She asks how we continue to believe that God is good, that He loves us, is a God of justice who heals and restores in the face of the extreme suffering we see in our world today. Follow the link below highlighted in red to read the article and soak up the beauty and freedom of restorative lament. God invites our questions and pleadings rather than our despair and silence. Tags: A Holy Experience, Anger, Ann Voskamp, Bethany Hoang, despair, God, honesty, justice, Kristen Deede Johnson, Lament, One Key to Walking Through Suffering, Pain, pleading, prayer, questions, restorative lament, suffering, The Justice Calling: Where Passion Meets Perseverance, Why? I miss my babies. I miss the life I used to live. I miss the sweet ignorance of not knowing what disease plagued Gracen and Katie’s bodies, the unappreciated bliss of an unknown prognosis. I miss my failure to understand that You, Lord, promised to walk through this life of trials with me, never once leaving me, but not to protect me from the free will of others and not to make life pain free. I miss waking up with purpose. Waking to enjoy the the birds singing and the sun shining. I miss hugs and smiles and laughter — the sounds of life in my home. I miss making cookies just to hear Katie’s whoop of joy. Watching David and Bethany laugh over movie lines that cause me to roll my eyes. Seeing Katie sit at Bethany’s feet joyful that her big sister was home from college. I miss arguments and bad attitudes and snark and sass. I miss seeing Katie curled up in David’s lap to watch a movie, David teasing Bethany and listening to him negotiate with Katie for hugs and kisses. I miss sibling rivalry and laughter and two ganging up on one. I miss hearing how Gracen stood up for Katie at school, how Bethany watched out for Gracen and coming home to find all three watching music videos loud enough for the neighbors on either side to enjoy (?) too. I miss praying for Bethany and Katie. I miss inviting You, Lord, close instead of desperately clinging to You. I miss what was and will never be again. I miss the life I’d planned to have. I miss ignorance and curse knowledge and I hate the last images of Bethany and Katie seared upon my mind, taunting me with their stillness, eyes once full of life and love vacant and unseeing. I miss the me I used to be; the me I wish I could be again. I miss the me who did not live with the ever present ache of loss. The me who did not have to fortify herself for a simple trip to church, the me who did not have to plan in advance answers to everyday questions to guard my heart, my privacy and to avoid making others uncomfortable. I miss genuine smiles. I miss the ease with which I faced a day and the dark of night; of restful sleep, a focused mind, and simple motivation. I miss anticipation and excitement. I miss having all the bar stools at my counter filled. . . I just miss so much — it all haunts me while I’m simultaneously thankful for Gracen and David. Joy and sorrow side by side — both aware of all I have and all I’ve lost in every moment of every day. One word defines my life — bittersweet. And as I rolled over and curled in upon myself, I asked the Lord to help me get up and get going, to be a good house guest, to ignore the onslaught of sorrow, deep and numbing. To be able to be present instead of withdrawing from everyday conversation in desperate need for time alone — for the distraction fiction provides. I finally rose at 10:30, hours later than I usually rise when we visit Kansas City. And when I entered living room Sunny greeted me with a warm, “Good morning sleepyhead”, and Donna quietly went about frying an egg for me, then sat down at the table to visit with me while I ate. No frustration, just uncomplicated acceptance and the kindness they have always shown me over the last twenty-eight years. I found my heart full to the brim with both gratitude and sorrow — both of which my wonderful in-laws share with me. I am not alone in my loss, in my sorrow, and in gratitude for what remains. Empathy (shared sorrow) is so much more comforting than the fellowship of sorrow and pity. Pity pops in to express sympathy and promptly exits. Pity is love without commitment. It lures and deceives the grief-stricken with a promise of support only to silently slip away. Shared sorrow blesses the grieving by claiming a seat at the table of sorrow and dining on the bitter taste of disappointment and despair; drinking from the cup of agony before pulling out the dessert plates and loading them up with the sweet savor of united hearts and minds. Shared sorrow is committed love. 1. People outside the immediate circle of loss, tend to view the death of a loved one from a broad, general perspective. The bereaved grieve in fine detail. Acknowledging specific losses, unfinished plans, a lost legacy and the empty seat at the dinner table communicates to the bereaved that you care about the depths of their loss. 2. Speak the loved one’s name. When a baby is stillborn or dies shortly after birth the family is left with a void they are unable to fill with memories of their child. Using their child’s name, asking about the infant’s birth weight, length and hair color affirm the child’s worth. Avoidance equals isolation. 3. Speak the loved one’s name-regardless of their age at the time of death. As time goes on, the name of a loved one is spoken less and less frequently. The bereaved want their loved ones remembered. Mentioning their name, telling a family member you thought of their loved one and you miss them is a great blessing. Speak about their loved one in a positive way, don’t just say how sorry you are for their loss. 4. Many bereaved parents feel as if others treat them as if they are cursed following the death of a child. Avoiding bereaved parents because you are unsure what to say or do can frequently be perceived in unintended ways. So, avoidance is not the answer. Call or visit and simply say, “I have no words.” “I don’t know how to help, but I want to be there for you. Tell me what you need to hear from me.”, and if you love the bereaved person keep trying to reach out, but don’t make them responsible for making you feel comfortable in their presence. 5. Don’t expect the bereaved to step back into ministry roles and other normal activities. Some will return quickly, some will take six months or a year. Some will never return to that specific ministry or activity. Be sensitive. Churches are often in need of members to serve, but be careful not to push. 6. Never compare the loss of a loved one to the death of a pet (it’s more common than you think). The loss of a child and a spouse are the most devastating losses the bereaved endure. Don’t tell the grief-stricken that you understand how they feel because you lost a uncle, grandparent or parent. The level of intimacy in the severed relationship determines the depth of grief experienced. 7. When a parent loses a child, never say, “Well at least you have two more.” or “Be thankful for the ones you still have.” The death of one child doesn’t negate the parent’s love for the rest of their children. Grief and gratitude can and do co-exist. And the birth of subsequent children do not replace the child that died. 8. Don’t be offended if the bereaved don’t personally call you to notify you of the death. It is not at all unusual to for the bereaved to be too emotionally overwrought to call even their closest friends and family members. It’s is however, very common to contact one family member and ask them to contact the rest of the family. It’s not a slight. Some are busy at hospitals, others are in shock, and some just can’t speak. 9. Don’t ask for details especially in the case of suicide, murder, or accidents. Those who need to will share that information with someone they are close to. Others do not want to remember their loved one that way and may have been traumatized by things they’ve seen and experienced. Rehearsing it is retraumatizing and sometimes leaves the bereaved feeling as if you care more about the gory details than you do about them. 10. If you have pictures of the deceased, email copies or get prints made and bring them to the family. Every picture is a coveted treasure. It’s time to get up, past time really. Breakfast, shower, dressing . . . then my turn. It all takes time, but I just do not want to get up and we’ll be late if I don’t get moving soon. It’s raining. Again. I hate rain during the daytime. Hair appointments at noon. Still, I’d rather stay in bed. Bury my head in my pillow — close my eyes — forget the world, it’s disappointments, my responsibilities — life and the fact that I’m still living it. Breathe in, breathe out. Breathe in, breathe out. Over, and over, and over, and over, and over, and over again. Why must I get up? Why must I breathe in and out? Why must I do it all over and over again? For the love of Gracen. It’s all for the love of Gracen. My heart is anchored here but I long to flee — from what happened — from what is yet to come — to fly far, far away. To flee this unwelcome reality — oh, to be able to pretend it never happened! To be able to board a time machine and travel back, back before the collision, back before diagnosis, back before Katie, before Gracen, before Bethany and Cole. Back before marriage, back before love, back before David, back before my very existence, erasing every footprint, every memory of me. Back before every bit of my existence tainted the lives of the people I love far more than life. Just to have the opportunity to un-hurt others by erasing me. It’s 10:34 a.m., I have to get up . . I can’t. I just can’t do it. Call David ask him to cancel our appointments. Ring, ring. Oh, no, she’s up! Hang up the phone. Get it together before she sees you! Ring, ring . . . Oh, crap, David’s calling back and Gracen’s right here! I can’t talk in front of her. Leaping off the bed, head down. Leave the room NOW! Find a place where she can’t hear you! “Janet, I can’t hear you . . .” David’s voice comes over the phone line. “Janet? Janet? What’s wrong?” David’s voice is Frantic now. More crying. I hear David’s breath hitch through the phone line. “Katie’s room.” The room next door to Gracen’s that now holds two twin beds without sheets and blankets, void of anything personal. Katie’s empty room spins through my mind. Forty-three more days until Gracen heads to college. I simply cannot unravel for forty-three more days. I tell myself, take your meds — get it together. You can get up for forty-three more days. You can. You can. You will. Wow! How did that get so out of control? It was Gracen’s appearance at the same time David called back. The ring tone flooding my system with adrenaline, silent tears turned to sobs as I desperately tried to flee my room preventing Gracen from seeing me in such a state. Oh, she’s seen me cry before, but only the controlled version. Not ugly, wretched sobs. But today I was not able to shelter Gracen from my grief. I upset her although no words were spoken. I know she is afraid she will lose another family member; she recently admitted as much. I fear that too, but for her, all that’s left to lose are her parents — the people who have always represented safety and security to her. I don’t want to inflame her fears. And David — he’s seen discouragement and apathy, he’s held me through tear filled nights, he’s shouldered extra burdens when normal parts of life just seem to overwhelm me. He’s been party to a meltdown or two or ten, but to receive a call at work — never before has he had to cope with a long distance breakdown even when I called to tell him an ambulance was transporting Gracen and I to the ER after a frantic 911 call. Today, I could hear the fear in his voice. It devastates me to know I did that to him! Heaping fear upon grief — I shoulder my load — Gracen’s and David’s too, as they are forced to shoulder mine as well. Grief felt far more individual when Cole died — or maybe time has just softened the memories, blurring the rough edges of grief, leaving some sharp and biting and others smooth and fading. 1. Understand that it is often a struggle for those who mourn to get out of bed, do everyday tasks, leave their homes, socialize. Others become hyper involved; anything to keep themselves moving, distract themselves from the constant pain. Those who mourn may bounce back and forth between the two extremes. 2. Realize that the bereaved often perform a grieving cha, cha, cha of sorts. They try to attack their grief, process and get through it, then overwhelmed, try to suppress it, hide from it, deny it’s existence and ignore it. Be prepared to go with the flow. Talk through their struggles with them if they bring them up, or grant them the freedom to talk about other things. 3. Be aware that grieving families often continue to be hit with additional health problems, trips to doctors, hospitals and emergency rooms can trigger mild to dramatic traumatic responses. What may be a minor problem produces anxiety on steroids. Pray them through, sit with them, validate their fears. 4. Wives seem to take responsibility for maintaining the emotional equilibrium in the home: husbands strive to protect and shelter. Loss makes both feel anywhere from inadequate to utterly incompetent. Grieving men need attention too. Most will never ask for it. Invite men to sporting events, movies, poker night, fishing or lunch. They may not talk about their grief, but your presence signals support and encouragement. 5. Understand that deep grief often brings remorse for having been born at all. Job felt this way. Pay attention to suicidal comments — don’t discount them. A desire to have never been born and suicidal intentions are not synonymous, however, comments to that effect should not be overlooked. Pray for wisdom and discernment to hear exactly what the individual is communicating through veiled speech. 6. Be aware that the sense of personal safety and security has been destroyed for every member of the family. Fear of experiencing another loss is both common and rational. While uncommon, many families have suffered separate and subsequent deaths of immediate family members. Please don’t discount or brush off a bereaved parent’s fears in this area. It is a legitimate fear and they need it acknowledged. Too Tired . . . I do not know how to do this life I’ve been left with and I really don’t want to figure it out. I’m tired – not, let’s just end it all tired, but physically, emotionally and spiritually tired. Tired from staying up later night after night. 3:00, 3:30, 4:00, 4:48, tired. Tired of trying to figure out what to do with myself, for myself, about myself. Tired of wondering why God didn’t simply take us all home December 26, 2013, the day of the collision that killed two of my daughters. Tired of wishing He had. Tired of thinking of what the future holds, tired of trying to brainwash myself into believing there just might be something good to get up for every day. Bone weary, heart achingly tired. Too tired. Just too, too tired. 1. Offer to take young children for a play date once a week. 2. Don’t push the bereaved into activities – taking on new hobbies, jobs, etc. 3. Invite them to do things you know they enjoyed in the past. If they decline, ask again another day. 4. Don’t expect the bereaved to behave as they did before the death of their loved one. They simply aren’t the same people any more. They have been irrevocably changed in many ways. Don’t encourage them to “get back to normal,” or question when they will. Don’t quash their attempts to talk about their feelings or their loved one. They are not wallowing in self-pity, they are experiencing and coping with the normal response to loss. Grief and self-pity are very different things! The message you are sending with comments such as these is that the bereaved are responsible for ensuring that others are not uncomfortable in their presence and that their loved one no longer matters. Telling them to choose joy is tantamount to telling them that positive thinking or gaining a new perspective will take their pain away. Ultimately, the bereaved feel both defiant and rebuked for loving deeply. Well-intentioned friends and family members inadvertently become unsafe for honest sharing. A failure to validate feelings elevates the turmoil the bereaved are already dealing with. They become angry because they have to justify their feelings and their right to mourn while simultaneously questioning if they are indulging in self-pity. Invalidation leads to isolation as the grief-stricken find they cannot vent their feelings and wrestle with their faith without rebuke or correction. Invalidation causes the bereaved to suppress their grief, wear a mask in public, hide their vulnerability and finally, it lengthens the time it takes to work through the process because the bereaved will search and search for safe people to be real with all in an effort to receive validation of both their feelings and the value of their loved one. 5. Realize that for the bereaved, feeling bad feels bad, but feeling better feels bad too. The psyche is telling the bereaved that feeling better, laughing, having fun and moving forward means that their loved one was not critically important in their life. Of course, that’s completely untrue, but it’s also a very common and normal way to feel. 6. Keep an eye open for signs of depression. Encourage a visit with their doctor for an antidepressant or antianxiety medications. Encourage grief counseling. Many churches provide Christian counseling services for their members, the uninsured or underinsured. Reinforce the truth that depression is normal and nothing to be ashamed of. 7. Keep an ear open for language that might indicate they might be at risk of harming themselves. If concerned about suicide, ask them outright. Share your concerns with their spouse, parent or their pastor. Don’t brush it off – take those words seriously. 8. Be aware that men, women, siblings and children grieve differently. Families struggle to do what’s best to allow each individual to grieve in the way that is best for them but those ways are often conflicting. One needs to talk, to be heard. Another can’t talk and can’t listen. If you are close to a bereaved couple, be sure they are understand that everyone grieves differently. Recommend meeting with a grief counselor if mismatched grieving styles are creating conflict. Why a glimpse behind the curtain to the deeply personal and hidden grief of a bereaved parent? Not to inspire your pity; of that, I can assure you. Instead to inspire others to look beyond the surface of a grieving friend or family member. To consider how families are affected by a loss, emotionally, psychologically and spiritually, as well as the unique family dynamics that result; which might help you comfort, support and encourage them. The bereaved desperately want to be understood, to have their feelings validated, to break free of the isolation, to mourn unrushed, to have another share their sorrow (not attempt to fix it). This post was written months ago and is not reflective of my current state of mind. There are days and moments and very long nights when I think, I can’t do this anymore. Come to find out, that simple thought is a trigger for tears. Intellectually, I know I can. Physically, I know I can. Emotionally, well there’s where the breakdown happens. I don’t know if my impending empty nest is permanent or temporary. I know who I am for the next three months but not who I will be after that. I’m really afraid of that answer. Emotionally I am weak, very weak. Within the borders of my emotions I fear failure — to prepare Gracen for what’s ahead for her physically — to be there for her in an effective way — to watch her experience the devastation wrecked by progressive disease — to experience it for myself alongside her — to watch David experiencing it alongside her, alongside me. To see the toll it takes on each one of us individually as we somehow continue to put on a brave face and hide the true depths of the pain and sorrow from each other so as not to increase their individual burden in this bizarrely intertwined protection dance we unconsciously perform. And as all this plays out within our home and personal relationships, the current culture demands that we have a positive attitude and recognize our blessings. It’s exhausting. It’s overwhelming. It’s frustrating. It’s impossible. “Don’t be afraid — trust God”, we are told in the midst of situations where there are very real things to fear. Sorry, those commands, biblical or not, are not helpful. I’m not saying they are wrong, just that they aren’t comforting and encouraging. It’s almost impossible to talk yourself out of fear — especially after your worst fear has already been realized. Those words, “Don’t be afraid — trust God”, heap indictment of failure on already emotionally overburdened believers who interpret those words as an accusation — “You aren’t trusting God”, instead of as the encouragement they are intended to be. At the same time, the searing pain within testifies to the truth that what we are trusting God for is eternal in nature. We are terrorized by the knowledge that our desires, for ourselves and those we hold dear in this temporary world, play second fiddle to God’s purposes. This, of course, I can attest to from all too much personal experience. God’s will serves our ultimate eternal good but the rub is that we reside in the here and now. And while from an eternal perspective our lives are no longer than a blip on a radar screen, in the here and now that blip lasts ten, twenty even thirty years or more. Our afflictions are light and momentary from an eternal perspective but they don’t feel that way in the day to day. Yes, I need to cultivate an eternal perspective, lay up eternal treasures, yadda, yadda, yadda. But frankly, there are days, moments and very long nights during which I’m too emotionally frightened and exhausted to exercise my spiritual muscles. 1. Pray that the bereaved will put on the full armor of God. Their faith is under attack and they are exhausted and deeply vulnerable. 2. Avoid the use of platitudes and trite phrases. They serve to frustrate and unconsciously communicate unintended messages. (i.e., faith and trust in God mean things hurt less, our hope for eternity exchanges grief for joy, joy and happiness are the same thing, the salvation of the lost justifies the death of a loved one). 3. Be extremely careful in the use of Romans 8:28, “And we know that all things work together for good to them that love God, to them who are the called according to His purpose.” (KJV) There are a time and place for every season under heaven. There are a time and place for this verse. I personally think it’s more harmful than helpful in the face of raw grief and more appropriate a year or two down the road when the bereaved can look back and hopefully recognize the fulfillment of this promise. 4. Be cognizant of the fact that believing God has filtered everything through His hands before allowing it to happen can lead a believer to blame God for the tragedies that befall them. In truth, spiritual warfare, an individual’s exercise of free will or the fall of man that affected all of nature are responsible for the death of their loved one. The fact that God allows bad things to happen to His children is not the same as causing bad things to happen. For all we know, Satan was tempting while God was pleading when another’s actions lead to the death of a loved one. “For ours is not a conflict with mere flesh and blood, but with the despotisms, the empires, the forces that control and govern this dark world–the spiritual hosts of evil arrayed against us in the heavenly warfare.” (Ephesians 6:12 ~ Weymouth New Testament). 5. Validate feelings. A grieving father who feels like beating the crap out of the person responsible for their child’s death is normal. It’s okay; it’s helpful actually to say, “I’d feel the same way if I were you.” Validating feelings in no way condones sinful actions. Feel free to tack on, “You’re not planning to act on that, are you?”, if in doubt. 6. Do NOT correct the emotions of the bereaved. Emotions are not right or wrong; they were designed by God and serve a purpose. A fellow mourning mother recently told me, “Emotions are for emoting.” How an individual responds to their emotions can be right or wrong but never simply expressing them. Do NOT tell the grief-stricken that they can’t or shouldn’t feel any given way or that their feelings are sinful! 7. Affirm the bereaved’s ability to continue on. Be there for them through cards, text messages, phone calls and lunch or dinner dates. Don’t take it personally if your call and invitations go unanswered. Simply try again another time. 8. Before you offer any advice, imagine yourself in that individual’s shoes; then personalize the advice. You are now the parent whose child just committed suicide. Consider how you might feel should someone tell you to count it all joy, or that God is good all the time, etc., before you offer any advice to the bereaved. Perspective changes when things get personal. 9. It is indeed rare for a bereaved person to continue in deep grief for an extended period of time (more than two years). There are always a few who never recover, however, Christians need to trust that God will heal the hearts of the bereaved as His word promises, in His time. There is a time to mourn and a time to dance (Ecclesiastes 3:4b KJV). When you encourage a fellow believer to move on, choose joy and be thankful for what they still have, you are, in effect, expressing that you yourself don’t trust God to heal their grief, but instead believe that the grief-stricken Christian must work to heal themselves. Several months ago David and I wandered down the hall to the main bathroom in our home. We stood inside and outside the doorway discussing if it was possible to widen the doorway (which sits on an angle) to enable Gracen’s wheelchair to fit through the door and other changes to make the bathroom accessible for her. It was a frustrating discussion because changes could be made that would work for now but maybe not down the road as Gracen needs a bigger wheelchair or moves into a power chair that has a wider base. If we remodel to fit Gracen’s current wheelchair, the changes would make it harder to sell our home later. What was the best choice for now? For the unknown later? How to decide? At one point I sat down on the closed lid of the toilet, bowed my head and grasp the hair on either side of my head pulling it away and growled in frustration. David’s eyes rounded and fairly popped out of his head in alarm as he asked, “Are you OK?” To which I responded something along the lines of, “NO, I’M NOT OK!! No, no, no, no, no, I am so very far from OK! I’m completely overwhelmed and I’m so freaking tired of trying to find the positive in the negative, of getting up every day without Bethany and Katie, of watching Gracen’s body change, of living!” A sob escaped and tears fell as David pulled me to my feet and wrapped me in his arms until the tears subsided. I didn’t, I still don’t want to move away from my home. Figuring out what we need in a new home is overwhelming; it’s costly, and how am I suppose to plan for the unknown future? How do I leave this place where my children grew up without them? How do I move into a new place without them around to make new memories? This home bears witness to their existence. To love and laughter and tears — to the last remnants of our intact family (as much as any place could in the absence of our stillborn son, Cole). That young man stole my daughters and Gracen’s mobility and now here I am, sorting through Bethany and Katie’s things in fits and starts, parsing out their lives bit by bit. Give it away? Keep it? Oh, God, throw it away? Troy Robins, an unlicensed & reckless driver, took Bethany and Katie’s lives and now I’m systematically removing them from my home; from their home. It feels so very wrong — as if I’m throwing my children away. No, no, no, no, no, I am so not OK! 1. Listen closely to what the bereaved say. If they tell you they are struggling with something, try to think of practical ways to help. Pray for those specific concerns. Keep your eyes open for needs they might not mention; yard work, snow removal, dishes that need to be washed, etc., then step in and take care of it. 2. Realize that you cannot fix their sorrow and they don’t want you to try. They want their pain acknowledged, not ignored, not rebuked, not corrected, and definitely not minimized. Validate their feelings and affirm their ability to carry on. Be aware that their faith may be strong but they are weak in so many ways. They will likely feel as if their faith is not sufficient to see them through. Do NOT imply or state outright that God allowed their loss because their faith was strong enough to survive their loss! 3. If they tell you they are having a hard time going through their loved one’s things, offer to come and help, or to simply sit with them as they do it. Do NOT try to go through those things with a get ‘er done attitude. Expect to listen to the bereaved reminisce. Expect tears. As uncomfortable as tears make us feel, they are a much-needed outlet for the grieving. Venting their sorrow is healing, so don’t cut and run at the first sign of tears. Locate the tissues. Offer hugs, if appropriate. *Please note, an offer to help with a task such as this should generally be extended by a close personal friend or family member. 4a. The grave site can be a place of comfort or distress. Every bereaved individual is different (which I realize makes supporting the grief-stricken challenging and scary). Some spend a lot of time at the cemetery, others rarely go. It’s generally a big deal when the headstone is finally placed. The headstone often represents the only permanent legacy of the deceased. Offer to take the bereaved to the cemetery. Comment on the things you sincerely like about the marker they’ve chosen and the location selected. Never offer a negative opinion about either the burial site or the headstone! 4b. Likewise when the deceased is cremated, the day the bereaved receive their loved one’s ashes is also a big deal. They’ve carefully chosen the urn—no negative comments! Some people display the urn, and others choose not to. Validate their choice as there will be people who are uncomfortable seeing an urn prominently displayed in a home and they will, unfortunately, let their feelings on the matter be known. There will also be people who will not understand if the grief-stricken choose not to display the urn. The bereaved often feel torn on such matters, and they need to do what feels best to them. No good, but plenty of harm, can come from burdening the bereaved with other’s opinions and expectations. If the bereaved choose to scatter their loved one’s ashes, honor their decision both in regards to how they wish to do it and who they wish to be present. 5. Extended family needs to honor with grace the way those in mourning choose to handle holidays, anniversaries and birthdays. I’m well aware that extended family members also grieve and may be disappointed or even hurt when the bereaved choose to forego family gatherings. But frankly; it’s not about you! The highest degree of consideration should be shown to those with the closest personal connection to the deceased. Piling guilt upon grief is insensitive and unkind. Expecting the bereaved to celebrate, to be surrounded by intact families, to shake off their sorrow for the sake of the rest of the family is unrealistic and frankly puts undo strain on the brokenhearted. Family togetherness may be beneficial to some, may lift their sorrow and make them feel supported, but not to others. Be considerate. Love your bereaved family members enough to set aside your own desires in order to grant them the freedom to mourn without criticism and resentment for the choices they make. **A word about bereaved parents of married children. When a married son or daughter dies, a unique set of circumstances arise. Depending upon the parent’s relationship with their in-law, things can go smoothly or be very difficult; especially when grandchildren are involved. Please pray for these families. Pray that the grieving parents and in-law can agree on funeral and burial arrangements, on seeing and spending time with the grandchildren, on holiday and anniversary plans. Emotions run high, relationships can be destroyed, and heartbreak can be compounded. Pray that both the parents and the in-law will be considerate of the other, that they will each be willing to compromise, and that the best interest of the grandchildren will be a priority on both sides. As a friend of either the parent or the in-law, allow them to vent their frustrations and I can’t say this enough, validate their feelings! 6. Assume that everything the bereaved tells you about how they are feeling or challenges they are facing, is confidential. A solid friendship can be utterly destroyed if the bereaved feels they are being gossiped about. Grief is hard. It hurts. Should someone inquire as to how the bereaved is doing, a safe response is, “She’s okay. She’s working through her grief.” Feel free to ask the bereaved how they would like you to respond to questions about their well-being and if there are prayer requests you can share. When in doubt, go with the safe response above. An individual who is normally an open book may become uncharacteristically private when they feel most vulnerable. Err on the side of discretion! 7. Be aware that the death of a loved one often leads to further problems, such as our need to find a fully wheelchair accessible home. Families are often left with staggering medical bills, traumatized children, loss of income, broken marriages and deep spiritual wounds. The bereaved are left emotionally overwrought, frightened and sadly, ashamed. Pay attention and look for practical ways to help.